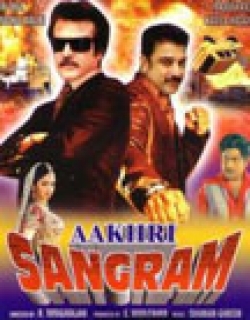 Aakhri Sangram is a 1984 Indian Bollywood drama, action film released on Jan 01, 1984. The film is directed by R. Thyagrajan, produced by G. Moolchand. Pushpa is a very confident and beautiful girl. She is in a very confused state of getting married to someone she doesn’t know. But, her father selects a guy for her named as Mohan. He is also associated to a very rich family. But, after few days she comes in contact with a guy named as Raja. But, her father doesn’t approve of her wedding with Raja. Now, it is to her to whom she should marry. Check out this page for more updates on Aakhri Sangram. This page provides latest and updated information about Aakhri Sangram (1984) movie which released on Jan 01, 1984. Aakhri Sangram (1984) is directed by , produced by , starring .We have also provided 0 trailers and videos, 3 photos, 0 user reviews, and 0 critic reviews.You can review, like, dislike this movie and also can add to favorites. You can also find information on showtimes, CDs, DVDs, online rental, online free watching.